My little brother, Dean well he isn't really little...he is 31 years old and over 6' tall, made these for the 4th of July. 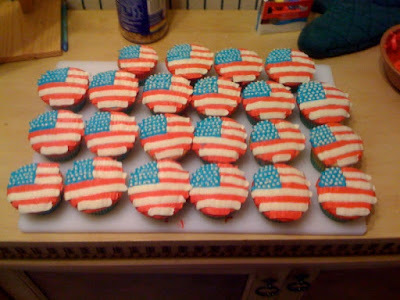 Aren't they cute, even the inside is red white and blue cake!! I am bummed that I didn't get to try one. Unfortunately for me Dean lives in California and I am in Colorado, so he sent me these pictures. Big hugs to my little brother Dean. Mom and I are proud of you and we miss you! 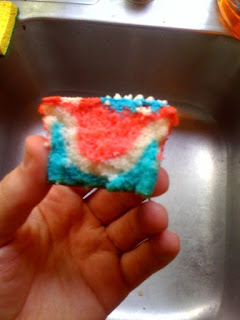 How in the world can you make a cupcake have three colored layers. I'll have to try this the next time I make them. Poor brother Dean is gonna have crazy crafting singles bangin' on his door now, thanks to his big sis. Can he do a video of how he made the cupcakes? Would he be willing to relocate to Canada? How beautiful and what a neat idea! You certainly have bragging rights! Blessings to you! I want to know how he did those as well....do you know???? Good job Dean! these look SCRUMPTIOUS!!! Hope you had a great Fourth of July! How about a little peek? !